A few weeks ago I lamented that I had started working out and cut back on coke, alcohol, and second helpings and in return felt like crap and gained two pounds. Y’all were so supportive and wonderful. I mentioned in that post that the only thing I knew was missing was tracking my calories. One of you suggested Lose It and Louise, if you’re reading, I can’t thank you enough! 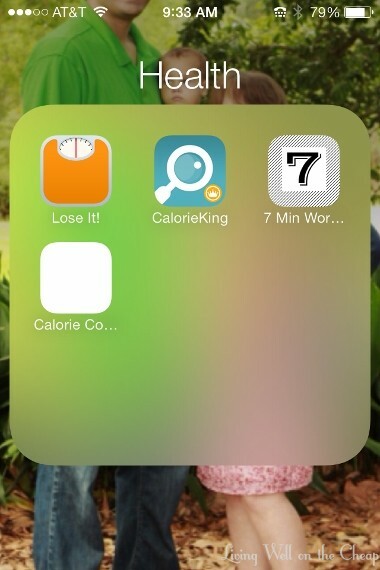 I’ve been using the Lose It app for the last three weeks and have lost a pound a week. Back when I was in grad school and trying to slim down for my wedding I tracked all my food and exercise in a small notebook. It’s hard to imagine that I didn’t have an iPhone back then! Technology sure does make things a lot easier. 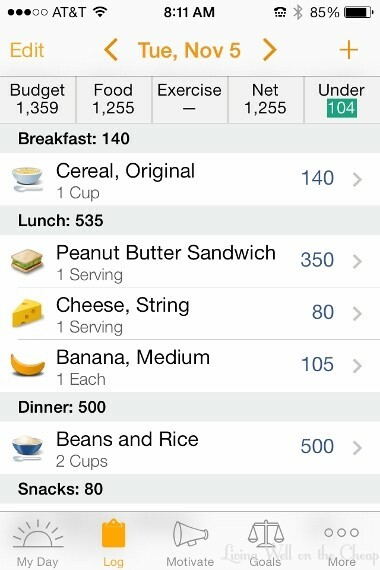 The app has a pretty large index of foods to search from or I can add my own. When something I’ve eaten isn’t already in the app I use CalorieKing’s food search or this recipe calculator to figure it out. I saved both of those websites to a folder on my phone’s home screen to make it easier on myself. But sometimes when I go out to eat I’ll just estimate (and try to err on the side of more calories, for example: wine night = 1000 calories). The gym membership I’d bought was actually a 6 week trial which has since expired. I enjoyed going and told myself that if I started working more hours I could justify the expense of a real membership, but now that I am working an additional day every week I’m not sure I want to. Since Jack is still napping twice a day there’s really only one window of time to get out of the house without missing a meal or a nap, and hitting the gym during that time every day meant that a lot of other things, like running errands or hitting up the park, got pushed to the wayside. Plus I wasn’t crazy about the gym nursery. I’m a little picky about who takes care of my kid and childcare is a necessity for me to work out. The good news is that using the app I can see that if I don’t exercise I just need to be more careful about my calories. I’m not saying that I definitely won’t return to the gym, but I’m just not sure yet. Any suggestions for burning 300 calories at home while Jack naps would be more than welcome! I want to be clear that this is not about looks or body image. I’ve done a lot of work on my self-confidence over the last few years and I pretty much think that I look great no matter how much I weigh (it helps to have a husband who reminds me of this regularly). This is about comfort and health. Hypertension, heart disease, and type 2 diabetes all run in my family and I know that the only thing I can do to prevent contracting these conditions myself is to eat healthy and manage my weight. And besides the whole death and disease thing, carrying even only twenty pounds of extra weight can be really uncomfortable. Little things like my thighs digging into the edge of my chair or wishing all pants had elastic waistbands add up to motivate me to make a change. I mentioned in my previous post that I’d been feeling tired, irritable, and unhappy. I’m thrilled to report that this seems to have subsided. I’ve been making a conscious effort to be more positive and to also put. down. the iPhone. The dinner table is now a phone-free zone and Nick and I are actually, you know, talking about our lives while we eat. I still get annoyed when Jack is clingy or Nick is singing the same song for the billionth time before 8am, but that’s life. I’ve also totally jumped on the bandwagon of identifying something to be grateful for every day of November. Gratitude is good for the soul, I think. Thank you all for being so supportive! I hope to be able to post again in a few weeks with an update that I’ve lost a few more pounds. Even with Thanksgiving thrown in the mix I’ve got enough leeway in my plan to be flexible. I hope you each have a wonderful weekend! MIND = BLOWN! Think I’m gonna get me a hula hoop stat! Well done Charlotte! I know I have found a ton of at-home workouts on Pinterest. There is a lot of crap on there as well, but I found a few Pilates series and things that you can throw in to your day while Jack is asleep. I would do a few of the Pop Pilates printables as a circuit and then be done with it (here’s one – haven’t used this one but to give you an idea: http://www.blogilates.com/printables-2/7930208843). There was a legs, abs, and arms set I did for a while and I definitely noticed a difference. It doesn’t seem like much, but it’s something and it helps tone! There are also tons and tons of workout videos on YouTube, etc that you can pop on a do quick while the little man is resting. Keep up the hard work! Ooooh, I used to love pilates! Thanks so much! App downloaded – thanks for the motivation! When you said about health and the discomfort of carrying extra pounds, it was like you read my mind!!! Thanks Charlotte! Yay!!! Great minds think alike! Good for you! I used to do MyFitnessPal and liked it, but I don’t know why I gave it up. I quit exercising and walking when I broke my foot last spring but returned to Zumba. I love the group time, but of course I don’t have a little Jack that needs a baby sitter. There are lots of good ideas above. Look around your area and see if there are any Mom and kid exercise programs. That might be fun too. I agree with you that it can’t be about looks. I am 63 so my expectations in that area aren’t high anyway, but I feel so much better when I keep active. I was having lower back pain that was completely gone after a month in Zumba! Zumba looks so fun to me! Maybe I’ll look around and see if there’s one in my area that has childcare. If not I’m sure I can find a video to do at home. My advice? Get a jumprope…if it won’t wake Jack, that is. 10 minutes of jumprope is equal to 30 minutes on the treadmill, seriously! You could standard skip rope, or lay the rope on the ground in a line and jump back and forth over the line. We use these exercises all the time in my kickboxing class…kicks my booty! I have heard that about jumping rope! I’d definitely have to do it outside but it’s worth a try. Congrats on the changes you’ve made! It sounds like that app is very useful. Does it give suggestions for foods or just help you track? I’m in a nutritional therapy program, so I just wanted to mention that one of the big things about losing weight in a healthy, long-term way is that it’s really important to get exercise in the mix. There’s more than one reason for this. It’s not just that it helps you burn calories that day; it’s that it gradually increases your metabolism, so even when you’re at rest, you burn more throughout your day. And that lets you cut back on calories a little less, so that you can still lose weight while eating enough to be able to fit all of the nutrients you need for your day in your diet. Things I like to do for workouts at home are yoga, dancing to awesome music (especially to try to get myself to get up and clean stuff) and I check out library DVDs of workout videos sometimes. If you happen to have Amazon Prime, there’s some free workout videos in their watch instantly section. I think Netflix has stuff like that too…Good luck!!!!! You’ve got a great point. I do have Amazon Prime and Netflix–I’ll have to look into what they offer. Thanks so much! Edit: just realized I neglected your question about the app! It does not make suggestions, but has a ton of pre-loaded exercises and foods to choose from or you can add your own. You can even scan barcodes for foods to pull up their info easily. Wow, that’s really awesome! It’s so great that people make these sort of useful apps! Day Four of Lose it! app, and I love it! Just makes me accountable and more fully aware of what I already know, yet I’ve learned a lot, too! Carleen, et. al., the app has an “add exercise” feature, and that is very motivating. Right now I’m just trying to walk more regularly (I hike but hiking season is winding down, soon to be done only on snowshoes and skis here in Northern Utah), and a 30 minute walk in one of our many parks allows me to fit in that snack or two. I am not hungry (I want to eat more, but I’m not hungry), and even after 3 days, I can tell I’m on my way. I have needed to drop these pounds for something like 10 years, I kid you not. Thanks, Charlotte, for your candid blog. I didn’t think you had weight to lose, but people tell me that, and I just laugh and say “if you only knew”.